The usual way to make clear ice cubes or balls is by using silicone ice molds. Problem is, silicone ice molds take a long time to make ice, and you are limited on the number of ice cubes you can make in a batch. 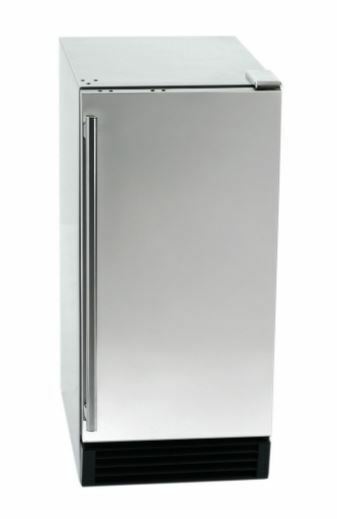 If you want to always have plenty of gourmet ice on hand for your home bar, then I recommend the Scotsman CU50GA-1A under counter ice machine. It’s our pick for the best under counter ice machine for home bars and is one of the best gourmet ice makers you can buy. Gourmet ice is great for certain drinks like whiskey, bourbon and some cocktails. This is not just because it makes the drink look more elegant; it’s also because of its slow-melting nature. It won’t dilute your drinks like other types of ice cubes. The Scotsman CU50GA-1A is designed for under-counter installation though you can also leave it freestanding if that’s what you want. The most important thing is to install it where you can easily run a water line. Because it is a gravity drain model, it’s also important that you locate it near a floor drain to which you can direct the drain hose. If you don’t have a floor drain, get the Scotsman CU50PA-1A. It’s the same model except it has a pump drain. This allows you to drain the water into a sink or a drain that is higher than the ice machine. 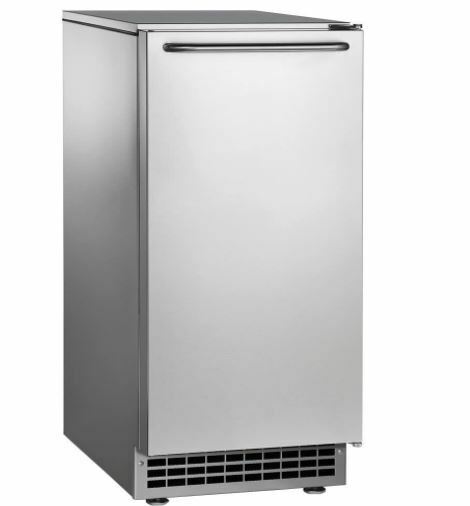 The ice maker is 15 inches wide and around 35 inches high, so it should fit under most counters. Installation takes a bit of time; around half an hour to an hour. It might be much easier to hire a plumber. When it’s ready to go the ice machine produces plenty of ice, enough for most families and the occasional home function. Overall, this is a great investment for those who love their drinks. Get it for your kitchen, home bar, lounge or den. As expected, the Scotsman gourmet ice machine makes a whole lot of ice - 65lbs per day to be exact. This is probably more than you need but comes in handy if you are hosting some guests. You can also install the ice in a small office or venue. The ice bin can hold up to 26lbs of ice at a time. When it fills up, the ice machine stops making more ice until you scoop some of the ice out. If you leave the ice in the bin for too long, it will start melting; the machine is only insulated not refrigerated. For longer storage, transfer the ice cubes to your freezer. This ice machine produces gourmet ice. It’s crystal clear without any of the white cloudiness you see in normal ice cubes. It’s the same kind of ice you find in bars and some restaurants. Because of the ice-making process, the cubes are harder and denser than usual. They melt far more slowly than average ice cubes. This makes them great for drinks which you don’t want to be diluted. You can sip your beverage slowly without worrying that the ice will melt and dilute the taste. To ensure the best quality ice, make sure you use clean potable water. The company highly recommends installing a filter in your water line. This will get rid of any minerals and particles that could affect ice quality. Also clean the ice maker regularly as directed in the manual. 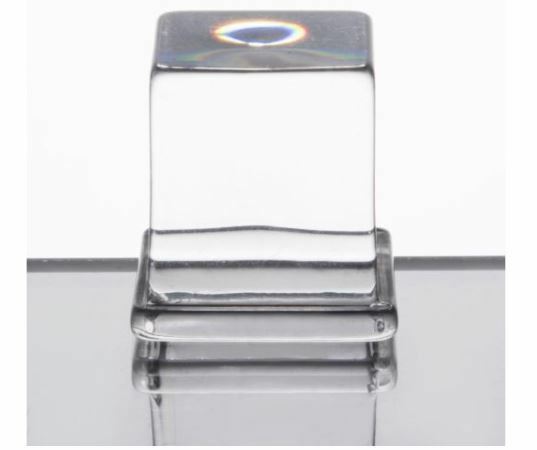 This prevents the cubes from acquiring a stale or plastic taste. The Scotsman CU50GA-1A is easy to use. The control panel, which is visible when you open the door, comes with buttons for switching the unit on/off and cleaning. There are also indicators for when there is no water coming in when the machine is working and for reminding you when it’s time to clean. The only bit of work is in installation. You can call in a plumber to do it for you.But unless you are rushed, it’s something you can do yourself. 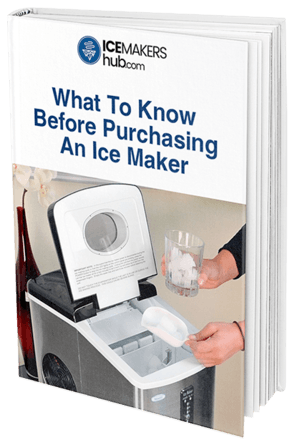 Block out around an hour from your schedule to install and test the ice machine. Customer feedback for the Scotsman gourmet ice maker is mostly positive. Users love the quality of ice and the fact that it’s available in plenty. Surprisingly, installation wasn’t a big issue for many users. They were able to do it on their own within half an hour or so. The machine is very solidly built; you can expect it to last for years without any issues. There were complaints that the machine can be a bit noisy as the ice hits the bin. But you won’t notice it when you are in another room. 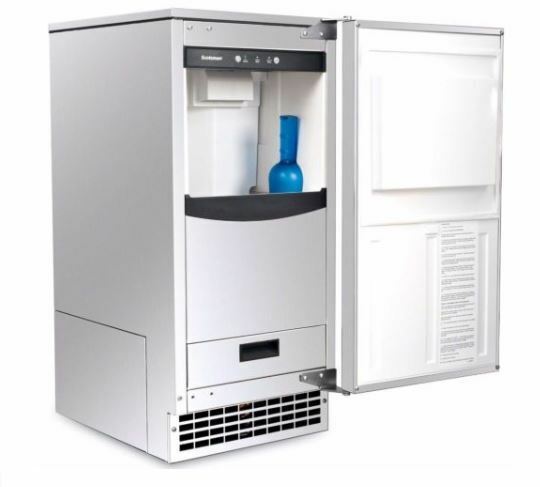 This unit is not cheap, but if you want proper gourmet ice – the same high quality of clear ice served in high-end bars–it’s a worthwhile buy. And you get to impress your friends who are used to the same old cloudy ice cubes. You no longer have to wait until you go to a bar or restaurant to enjoy a drink chilled with gourmet ice. With the Scotsman under counter clear ice maker, you can enjoy slow-melting and elegant-looking ice in your favorite beverages.